The folks at Epson revolutionized the desktop printing industry a couple of years ago when they introduced their EcoTank printers. Well, it seems the original printers mated and have spawned seven offspring. three of which we had a chance to play with. Of course they all boast similar basic features, but there are a few distinct differences. 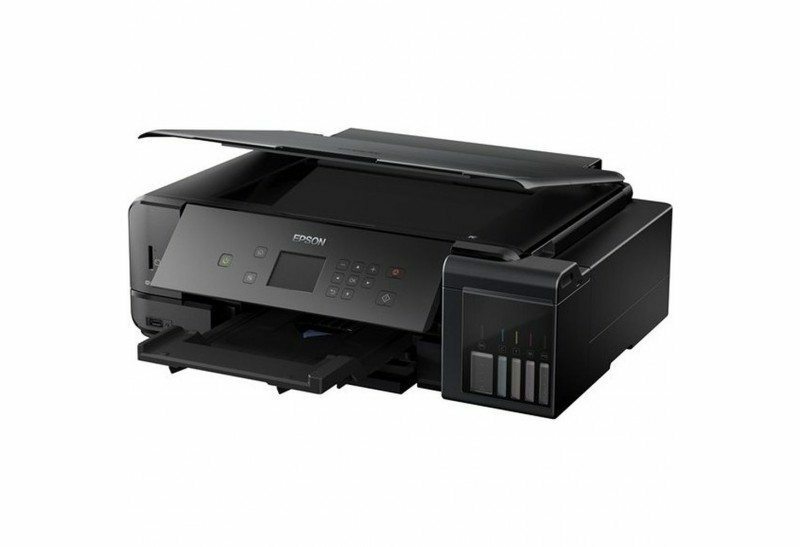 For example, the Epson Expression Premium ET-7750 ($649.99) has the most features including a fifth ink tank (for photo black ink), a high-speed USB port and an SD card slot, enabling us to print without a computer. It’s also a so-called “wide format” printer that can handle paper sizes up to 11 inches by 17 inches. The LCD touch screen is also a bit larger at 2.7 inches. The Epson WorkForce ET-4750 ($499.99) is a mid-priced smaller format printer designed for the home or office. It has the largest paper sheet tray of the three, with a 250-sheet capacity, but does not have USB or SD card slots. The touch screen is 2.4 inches. The ET-4750 is also the only printer of the trio that includes faxing capabilities. The Epson Expression ET-2750 ($299.99) is the smallest and lightest of the trio, with a 1.44-inch LCD panel and an SD card slot. It is also the only printer of the trio that lacks a paper tray, which means all paper must be fed through its rear sheet feeder. The other two have paper trays and sheet feeders. It is rated at 6,500 black pages or 5,200 color pages before you need to purchase more ink. The other two printers can print up to 14,000 black pages and 9,000 to 11,200 color pages. Obviously you get what you pay for, but, since all three are EcoTank printers that use liquid ink instead of cartridges, the overall savings versus having to replace printer cartridges is significant. For example, set of ink bottles equals about 30 cartridge sets, which (at, say, $10 per cartridge) is a total savings of $1,200. The ET-7750 and ET-4750 use what Epson calls PrecisionCore technology, which, simply put, increases print speed and quality using a high-density print chip. All three printers come with two sets of ink bottles (one bottle for each color). Each bottle is designed to fit securely into each labeled tank, which eliminates the risk of spillage. You’ll also discover that the tanks don’t hold a full bottle’s worth of ink during the initial setup. This puzzled us a bit, until we discovered that the ink tests performed by the printers use the equivalent amount of ink that was left in the bottles. Hence, we were able to empty them after the testing was done. Epson has made design changes in this new wave of EcoTanks. The ink tanks have been moved to the front of the printers from the sides, making the printers less bulky. The new auto-stop bottles have eliminated the need to snip the tips off each bottle and squeeze them to fill the tanks, also eliminating the risk of spillage.